Visiting London and seeking for a place to swim? Nice option! Don't forget to tell us how did it go. 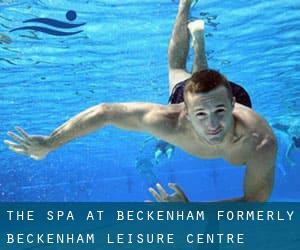 Introducing now The Spa at Beckenham (f. Beckenham Leisure Centre) swimming pool, a great swimming pool sent by a swimmer like you few days ago. Have you visit this pool? Do you perform here? Please, contact us if you have facts that you feel is gonna be beneficial and remember from now on you'll be able to now promote each pool just by sharing this page with your buddies or adding comments within the Facebook boxes below. Come on and assist this pool to be the first in London! Swimmers like you have reported 25 meters, 8 lanes, Indoors. Also, you will find 20 meters x 10 meters teaching pool, Indoors. If you need to make contact with this Swimming Pool, e-mail address and phone number are both number. If you believe that any of the information is incorrect, please make contact with us. Help us be better day-by-day. Updated on 2019 Beechcroft Road , Tooting , London - South , England , UNITED KINGDOM (Postal Code: SW17 7DF). This sports centre offers 25 meters, 4 lanes, Indoors. Updated on 2019 Lychgate Rd. , Orpington , London - South , England , UNITED KINGDOM (Postal Code: BR 6 0TJ). Among all the activities offered by the centre, in case you are interested in swimming you are going to enjoy 33.3 meters x 15 meters, 6 lanes, 1 meters - 2 meters depth, 1 meters - 2 meters depth, Indoors. If you must contact this Swimming Pool, e-mail address and phone number are both number. Updated on 2019 261 Lewisham High St. , Lewisham , London - South , England , UNITED KINGDOM (Postal Code: SE13 6NJ). This great and large sports centre lets professional swimmers like you enjoy 33-2/3 yardsm x 12.5 meters, 6 lanes, Indoors. Additionally, within these facilities you can try 18 meters x 7 meters teaching pool, Indoors. Phone number and e-mail address are number for this Swimming Pool. Updated on 2019 21A Piccadilly , Piccadilly , London - Central , England , UNITED KINGDOM (Postal Code: W 1J 0BH). Among all the activities provided by the centre, if you are considering swimming you can expect to enjoy 50 feet x 35 feet, 1 meters - 2 meters depth, 1 meters - 2 meters depth, Non-Chlorine Sanitized, Indoors. Just in case you want to make contact with this Swimming Pool just before dropping by, we only know the phone number. Updated on 2019 Seymour Place , Marylebone , London - Central , England , UNITED KINGDOM (Postal Code: W 1H 5TJ). Swimmers like you reported 30 meters, 3 wide lanes, 0.76 meters - 2 meters depth, 0.76 meters - 2 meters depth, Indoors. Phone number and e-mail address are number for this Pool. Updated on 2019 Ironmonger Row , Clerkenwell , Islington , London - Central , England , UNITED KINGDOM (Postal Code: EC1V 3QN). Among all the activities offered by the centre, in case you are interested in swimming you are going to enjoy 30.5 meters x 12.5 meters, Indoors. If you must contact this Swimming Pool, e-mail address and phone number are both number. Updated on 2019 Eastcote Rd. , Ruislip , London - West , England , UNITED KINGDOM (Postal Code: HA4 8DZ). This sports centre offers 33.3 meters, 6 lanes, Indoors. For this Swimming Pool, only phone number is number here. Updated on 2019 Westcroft Rd. , Carshalton , London - South , England , UNITED KINGDOM (Postal Code: SM 5 2TF). This sports centre provides 33.3 meters x 12.5 meters, Indoors. Contact facts for this Swimming Pool similar to phone number and email address are number. Updated on 2019 Malden Road , North Cheam , London - South , England , UNITED KINGDOM (Postal Code: SM 3 8EP). Among all of the activities offered by the centre, if you are considering swimming you will take pleasure in 30 meters x 12 meters, Indoors. If it is advisable to contact this Swimming Pool, email address and phone number are both number. Updated on 2019 Wheatsheaf Lane , Staines , London - West , England , UNITED KINGDOM (Postal Code: TW18 2PD). Swimmers like you reported 20 meters x 15 meters, Indoors. Phone number and e-mail address are number for this Swimming Pool. Updated on 2019 Donnington Rd. , Willesden , London - North , England , UNITED KINGDOM (Postal Code: NW10 3QX). Among all the activities offered by the centre, if you are interested in swimming you may take pleasure in 25 meters, 6 lanes, Indoors. If you might want to get in touch with this Pool, email address and phone number are both number. Updated on 2019 324 Barking Road , East Ham , London - East , England , UNITED KINGDOM (Postal Code: E 6 2RT). This sports centre delivers 25 meters, 6 lanes, Indoors. Contact details for this Swimming Pool just like phone number and e-mail address are number. Updated on 2019 Balaam Street , Plaistow , Newham , London - East , England , UNITED KINGDOM (Postal Code: E13 8AQ). Swimmers like you reported 25 meters, 0.8 meters depth at the ends, 0.8 meters depth at the ends, Indoors. Unfortunately we do not have the email address of this Swimming Pool, but we can give you the phone number. Updated on 2019 281 Prince Regent Lane , Newham , London - East , England , UNITED KINGDOM (Postal Code: E13 8SD). Swimmers like you reported 25 meters, 6 lanes, Indoors. Unfortunately we do not have the e-mail address of this Swimming Pool, but we can give you the phone number. Updated on 2019 221 The Highway , Wapping , London - East , England , UNITED KINGDOM (Postal Code: E 1W 3BP). This sports centre delivers 33 meters x 15 meters, 6 lanes, 1 meters - 3.8 meters depth, 1 meters - 3.8 meters depth, Non-Chlorine Sanitized, Indoors. For this Swimming Pool, only phone number is number here.